"Burning, and full of passion, as their name suggests"
"Lots of delicacy and atmosphere, their interpretations were utterly convincing in both style and taste." Burning and full of passion, as their name suggests, Sospiri Ardenti brings to audiences staged chamber music of the baroque era. They collected rave reviews from the international press with their programs 'The Nightingale", a family opera on a story by H.C. Andersen set on music by Telemann, and a program of Shakespearean music from 'The Tempest' and 'Twelfth Night'. Read reviews here! Their first CD is released on Kattenberg Recordings. Listen to some tracks by clicking on the CD image. 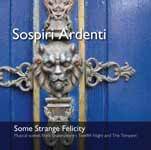 The ensemble Sospiri Ardenti specializes in the music of the late Renaissance and early baroque -- a period of turbulent discussion about the pat hs new music should follow and passionate interest in the many ways musical texts could and should be emphasized in performance. The name Sospiri Ardenti („Passionate Sighs") was taken from a song title in Giulio Caccini's 1601 collection Le Nuove Musiche. Caccini's search for new musical directions, his emphasis on the dramatic and textual qualities of music, formed a bridge between the humanistic philosophy of the Renaissance and the dramatic possibilities of seventeenth century opera and so served as inspiration for the formation of the ensemble. The four members of Sospiri Ardenti are specialists in historical performance practice and have performed with renowned ensembles such as the Flanders Recorder Quartet, Capilla Flamenca, Ensemble Weser-Renaissance, Zefiro Torna, Ex Tempore and the Balthasar-Neumann-Chor.